Gosh I love TAAFI. You can ask Mike, he’ll back me up. The atmosphere is what I like the most, I think. The air at TAAFI is laid-back and happy. There are cartoons to watch, panels to attend and lots of people who are more than happy to meet you! So when TAAFI announced that they were going to add their Maarket to the mix, I was thrilled. I’ve only tabled at a few conventions/festivals so far and adding TAAFI to my roster seemed like an excellent idea. I bought half a table and did up an illustration for the art book they were releasing in conjunction with the Maarket. The Maarket ran during the weekend events. Saturday 9-8 and Sunday 11-6 were the open hours, and we set up in George Brown College Waterfront Campus. When you came in you walked through all the studio and school booths. Many studios had come out to recruit, so if you were looking for work there were plenty of chances to find some. After that it was all artists and vendors. Labyrinth books and The Beguiling had tables with many excellent art books and comics. I was lucky enough to be placed right next to the table CAR was sponsoring, which meant I got to meet all the fantastic artists that CAR rotated through. To name a handful we had Aaron Hong, Mike Geiger, Dave Cooper, Kris Pearn and Jessica Borutski. The CAR table wasn’t the only place with big names either, since Stephen Silver had a table and Imaginism Studios was set up too. 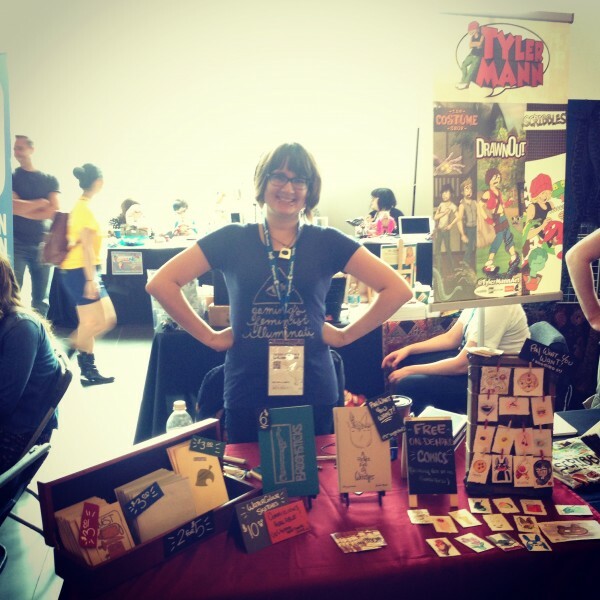 If I was nervous about tabling without a partner, that was incredibly foolish of me. Literally every single person I spoke with over the weekend was friendly. I made friends with my neighbours within 20 minutes of the show starting (it helped that my table mate had brought Timbits with him) and had friendly chats with many artists when I abandoned my table to wander around. The caliber of art present at TAAFI was excellent. A few people (like the Shanahans and Meaghan Carter) were established independent comic artists, and we even had some video games! The Hand Eye Society was presenting a series of games made by first time game-makers, which were both fun and inspirational to play. TAAFI 2014 is the first year to feature the Maarket. On the whole, I had an excellent time. With that in mind, I am going to review the Maarket from the perspective of an exhibitor. TAAFI’s Maarket was set up in the heart of the festival, there were panels and activities going on above and below our location, as well as in the Corus building directly next door. This was reflected in the traffic patterns, you’d get more people directly after something ended, and then it quieted down a fair bit whenever a particularly sought after panel/workshop was happening. The TAAFI crowd is a unique one because it’s comprised mostly of industry professionals or aspiring students. Most conventions and festivals that you sell at have a lot of laypeople/fans/casuals at them, and it’s the latter rather than the former that tend to spend money. TAAFI’s location is excellent because everything to do with the festival is in such close quarters. However, since the harbourfront is so far from downtown and you have to deliberately travel there, you weren’t going to snag a single person by accident even though it was free to get in. The location is incredibly stellar for the festival itself though, so I wouldn’t ever expect it to change. The floor effectively went Studios –> Art Stuff, which I agree with. However, Stephen Silver and Imaginism were located at the halfway point in the ‘Art Stuff’ section, which caused a lot of people not to bother walking all the way through to the back. The art book/comic vendors were also centrally located, when I think it would’ve been smart to place them closer to the back. Many people would spend 80$ on an art book and leave feeling satisfied with their shopping experience, instead of maybe spending 5$ here or 10$ there on independents before they emptied their pockets. Saturday was a long day for everyone. I would’ve opened later and ended earlier on both days. People party at animation festivals, so you don’t really get any traffic until 11 at the earliest. People also like to eat, and then likely party again, so you want to close down around dinner time. 11-6 and 11-5 would’ve been my ideal hours for this weekend. I’m not going to lay out numbers, but the table cost for TAAFI was too high. It’s a very young festival, the tabling was only 2 days, and the location wasn’t going to be bringing in anyone off the street who happened to be wandering by. I have purchased full tables at older, busier, longer and more conveniently located conventions for the same price I paid for my half table. If the Maarket becomes a hoppin’ event, then the prices to exhibit there are more than welcome to go up, but the consensus among many exhibitors was that breaking even became a goal instead of turning a profit, and the base cost of showing up is a big factor in that. Were wonderful. Yellow and green shirts alike were very helpful, some gave me water and 3 separate people made sure I knew how to access the wifi. I had no idea where to go Sunday morning and was personally escorted to my workshop. There’s a lot of intangibles that go into the success of a festival. All my critiques aside, the fact that this is the first year for Maarket meant a lot of people didn’t necessarily show up with the mindset of spending money. The fact that I made significantly more sales on Sunday than Saturday is evidence of that. It will take a few years to build this kind of thing up, you aren’t going to be immediately successful. Rarely is anything like this successful right out the gate. If all the factors I covered in my review remain unaltered, it will unfortunately not be financially viable for me to exhibit next year. But with a few adjustments, I would really love to come back and try this again. TAAFI Maarket 2014 was a great first effort. I met so many lovely people and I look forward to seeing what changes are brought about to make it even better in 2015. If I can’t table, I will still be attending. Unless they get rid of the band. If there’s no band I’m never coming back. This entry was posted on Wednesday, June 18th, 2014 at 5:25 pm	and is filed under commentary. You can follow any responses to this entry through the RSS 2.0 feed.